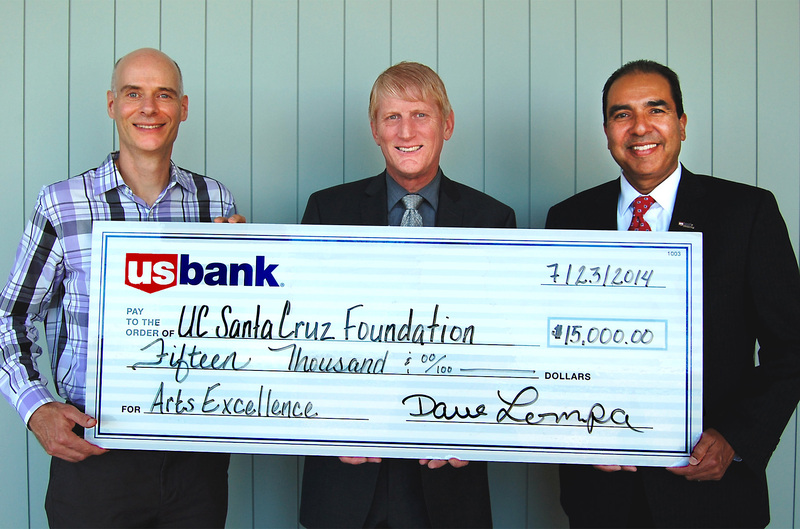 On July 23, US Bank generously donated $15,000 to the Dean’s Art Fund for Excellence. And what made the event especially significant was that Steve Martinez, US Bank’s South Bay District Manager and Dave Lompa, US Bank’s Aptos Branch Manager, stopped by UC Santa Cruz and delivered the check in person to Acting Dean of the Arts, Martin Berger. "U.S. Bank is committed to supporting arts and cultural programs across the country, and right here in Santa Cruz," said Steve Martinez. "Minds are enriched when art is embraced, and we applaud the university for inspiring young minds and developing talents in the creative space." key programs, including Shakespeare to Go, The Arts Dean's Lecture Series, the UC Santa Cruz Opera Theatre, the UC Human Rights Fellowship, and programs that directly relate to providing free UC Santa Cruz Arts Division-events tickets for low-income students. "We're honored to partner with US Bank and salute their long-term commitment to the arts,” said Martin Berger, Acting Dean of the Arts. “Their generous support has allowed us to bring musical and theatrical performances to UC Santa Cruz undergraduates and local high school students." California Metro, area has been the guiding force in the decision to support the Arts at UC Santa Cruz over the past four years. He also has been responsible for identifying community advocates, such as Steve Martinez, so that the partnership grows and remains strong. Darrell Brown, US Bank’s Senior Vice President in the Greater Los Angeles area, serves on the Arts Dean’s Leadership Board, and has been an advocate of the arts at US Bank and in the Los Angeles area for many years. million customers. Their Santa Cruz branch is located at 110 Morrissey Blvd. and offers student financial services, including free checking with no minimum balance requirement.